The term ‘green infrastructure’ was introduced to London landscape planning in the 21st century (in the 2008 revision of the 2004 GLA London Plan). 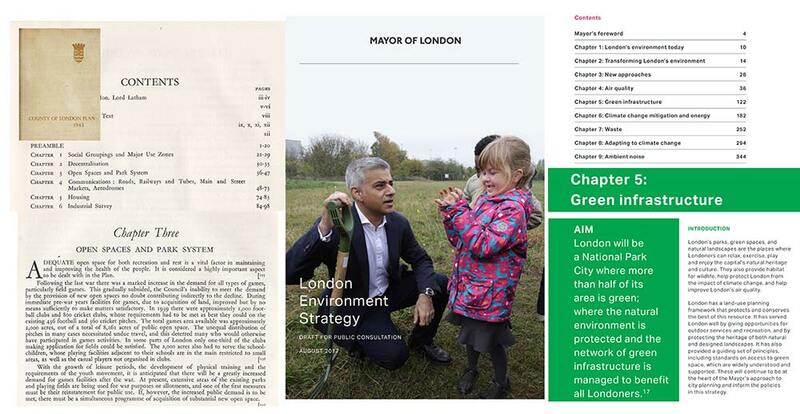 The 2017 Draft Environment Strategy, which will become part of the 2018 London Plan, uses Green Infrastructure as the title of Chapter 5. It makes an interesting comparison with the famous Chapter 3 in the 1943 County of London Plan, which had the title Open Spaces and Park System. The 1943 and 2017 plans both focus on public open space and both use the concept of ‘open space deficiency’. I have long regarded the old target of 1,000 acres of open space/1,000 people as unrealistic. The new emphasis on green roofs will make it more feasible. The scope of the 2017 plan is notably wider than its predecessor. When discussing ‘open space deficiency’ (now called Areas of Deficiency, or AoD), ‘open space’ still means ‘vegetated space’. The glossary to the 2017 document defines ‘green infrastructure’ as ‘A network of green spaces – and features such as street trees and green roofs – that is planned, designed and managed to deliver a range of benefits. These include mitigating flooding, cooling the urban environment and enhancing biodiversity and ecological resilience, as well as providing more attractive places for people’. Similarly, the All London Green Grid is explained as ‘a green infrastructure policy framework set out in Supplementary Planning Guidance (SPG) to the London Plan’. The introduction to the 1943 plan refers to ‘recreation and rest’ and to ‘improving the health of the people’. As clarified in the second paragraph the emphasis was on sport. Though London open space planning has become more sophisticated it is still confined to the planning of vegetated space. ‘Green’ can be used in this way. But it can also be used, as in the term ‘green transport’ to mean ‘environmentally good’. I regard Trafalgar Square and Covent Garden as ‘green’ spaces. Their planning, and that of similar places and interlinking green routes, should be integrated with the planning of more vegetated open spaces. My preferred categorisation for this more-comprehensive approach is ‘landscape planning’. The aim is to create a good urban landscape. Chapter 3 of the 1943 Plan dealt with Open Spaces and Park System. The equivalent terms, in London’s 2017 Draft Environment Strategy are Green Infrastructure and the All-London Green Grid. The main difference is the 2017 inclusion of references to mitigating flooding, cooling the urban environment and enhancing biodiversity and ecological resilience. The photograph of Mayor Sadiq Khan crouching in a wild flower meadow and, it appears, talking about ecology, emphasises the difference between 1943 and 2017.